Summary: Aura’s life is anything but easy. Her boyfriend, Logan, died, and his slides between ghost and shade have left her reeling. Aura knows he needs her now more than ever. She loves Logan, but she can’t deny her connection with the totally supportive, totally gorgeous Zachary. And she’s not sure that she wants to. Great series, thank you for putting this out there for us, shade was amazing. I always enjoy her books, I'd love to read this one. Thanks for all the super-mega-awesome giveaways! This book sounds like a keeper. Please enter me. 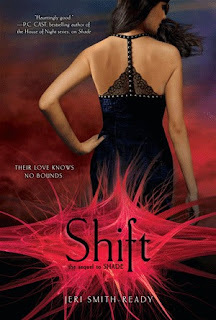 I really enjoyed Shade--I can't wait to see what she has in store for Shift. Thank you for hosting these giveaways! Just bought the first one in the series and would love to read this one too! LOVED LOVED LOVED Shade!! SOOOOO much love! I loved Shade so I can't wait for this one! I already own Shade, so this would be a great addition to my collection. I LOVED Shade! It was one of the best books I read last year. Thanks for the giveaway! I've heard nothing but great things! This sounds exciting. Thanks for all the fantastic giveaways. Can't wait for this one. Thanks for the giveaway. This is one of my favorite series OF ALL TIME! I'd love to have a signed copy!! OMG I live this series, I definitely want this book! Thanks for the giveaway! I'm loving all of these giveaways, thanks! I love Jeri Smith-Ready, sign me up! Shade was amazing! I can't wait for this! I LOVED Shade. I can't wait to read Shift! Loved the first one. Can't wait for this one. Thanks for the giveaway!